Ironically, this active accumulation of international reserves, in retrospect, sowed the seeds for the world economy to provide ample liquidity for advanced and profligate economies, which eventually led to those economies’ bubbles and busts in the late 2000s. Furthermore, increased dollar liquidity has made EMEs more vulnerable to US policy changes, thus making it appear as though economies are subject to “global financial cycles” (Rey 2013). In other words, it was a self-fulfilling prophecy that EMEs’ efforts to hold international reserves to ensure self-insurance or protection ended up creating an environment in which these economies needed insurance or protection. 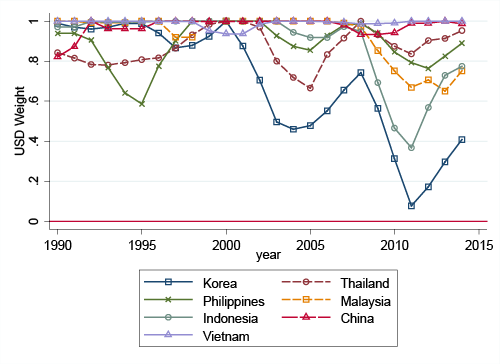 Against this backdrop, in a recent paper we assessed the East Asian economies’ openness to cross-border capital flows and exchange rate arrangements in the past decades, with the main focus on EMEs in the region and found several interesting characteristics about the economies (Aizenman and Ito 2016). One useful way of evaluating open macroeconomic policies is to observe the macroeconomic conditions and policies through the lens of the ‘impossible trinity’, or the ‘trilemma’ – Mundell’s hypothesis that states that a country may simultaneously choose any two, but not all, of the three goals of monetary independence, exchange rate stability, and financial integration. 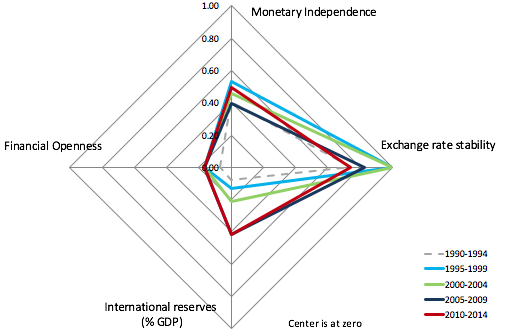 The ‘diamond charts’ in Figure 2 trace the changing patterns of the trilemma configurations while also incorporating international reserves holdings (Aizenman et al. 2008, 2010, 2011, 2013). 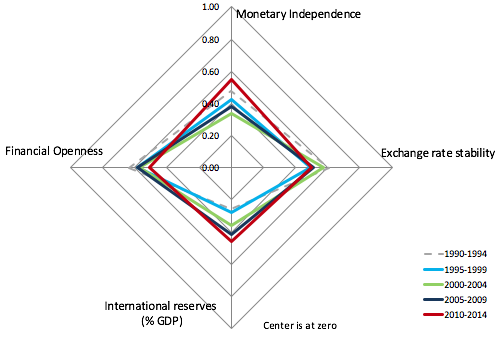 In each ‘diamond’, four vertices measure the trilemma policies and international reserves/GDP ratio with the origin normalised so as to represent zero monetary independence, pure float, zero international reserves, and financial autarky. 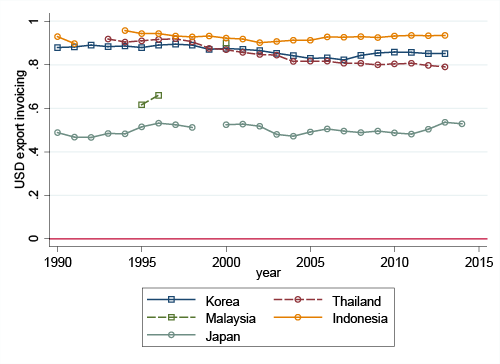 Figure 2 illustrates that Asian EMEs have converged to middle-ground levels in each of the three trilemma policies. 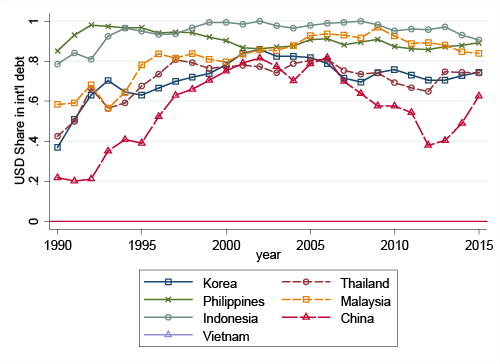 While this trait can be observed among many EMEs, Asian EMEs distinctly have experienced such middle-ground convergence since as early as the 1980s while appearing to maintain such a coordination through holding high levels of international reserves. These characterisations are not applicable to other economies such as Latin American economies and the Eurozone economies. 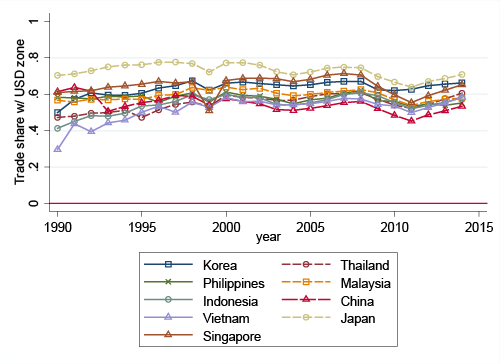 Despite medium levels of financial openness, many Asian EMEs have also had their asset prices and interest rates increasingly vulnerable to global movements of capital. In Rey’s view (2013), the centre country’s monetary policy influences these economies’ national monetary policies through capital flows, credit growth, and bank leverages. 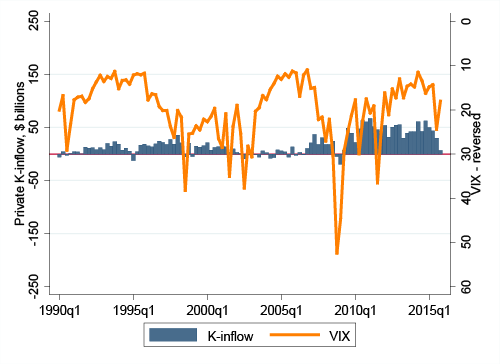 Figure 3 illustrates that the volumes of capital flows to EMEs tend to rise when the risk appetite is higher (i.e. 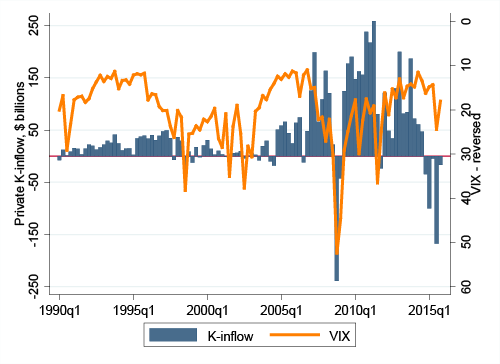 a lower VIX index). 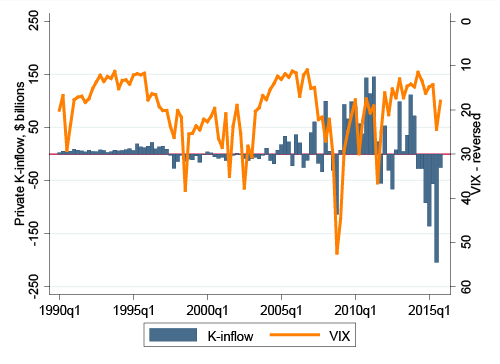 Prior to the Global Crisis, a large volume of capital flowed into EMEs, though this was followed by massive capital outflows once the Crisis broke out. 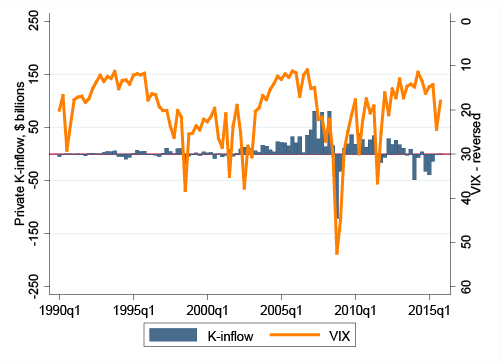 However, the capital flow became reversed with massive capital flowing back to EMEs again once advanced economies implemented zero, or extremely low, interest policies to fight recessionary situations. This generalisation of ebb and flow of capital applies well to Asian EMEs, though not to the other regional groups of EMEs. Both the full EME sample and the subsample of Asian EMEs also show massive capital outflows once the US started downsizing its unconventional monetary policy in 2014. In short, Asian EMEs are more directly subject to the level of risk appetite and US monetary policy. However, it is not (just) the US that has so much significant influence on the Asian economies. It is also the dollar that has been overwhelmingly important for these economies. That is reflected in high levels of reliance on the dollar as a trade invoicing or settlement currency. In Korea, Thailand, and Indonesia, 80% or more of the countries’ exports are invoiced or settled in dollars. Even in Korea, the largest economy after China and Japan in the region, the dollar share is about 85%. Japan has half of its exports invoiced in dollars despite its long-time efforts to make the yen one of the major international currencies (Figure 4a).2 This is understandable considering that webs of extensive and intensive supply chain networks exist in Asia with most of their exports aimed at the US as the final market. 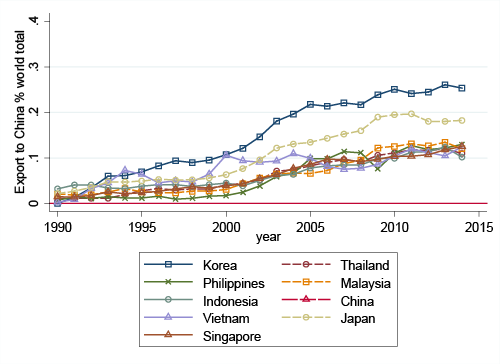 Despite the constant reliance on the dollar, the share of the US as an export destination has been declining for most of the major Asian EMEs (Figure 5a), while the share of China as an export destination has been rising (Figure 5b). When we estimate the share of trade (i.e. exports plus imports) for each of the four currency zones we identify, interestingly, the share of trade with the ‘dollar zone’ economies has been quite stable over time, ranging from 50% to 70% across countries (Figure 5c).5 The share of ‘dollar zone’ trade for Japan has been quite high, ranging from 62% to almost 80%, though the country is an issuer of one of the four major currencies. Thus, despite the declining share of trade with the US, the dollar continues to be influential for the Asian economies, explaining why they are susceptible to shocks arising in the US financial markets despite their intermediate levels of financial openness. The continuing importance of the dollar is partly driven by the fact that China is quite a dollar-oriented economy. Clearly, China’s increasing presence as a trading partner for Asian economies has replaced some of the US presence. 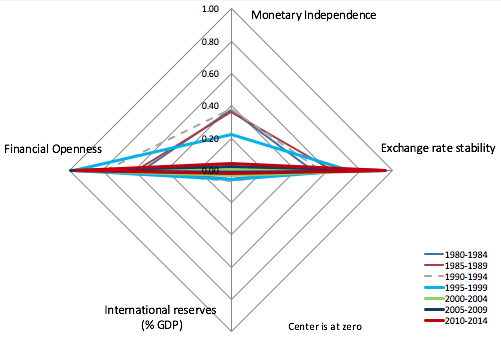 Thus, if China succeeded in ‘internationalising’ its currency, the yuan (RMB), and forming its own currency zone, the picture in Figure 5c could change significantly. Now the question is whether and to what extent the RMB will become an international currency. Rising Chinese income levels and the country’s role as a major global trading country will help the RMB to become more widely used in the global markets.6 However, two uncertainties warrant attention regarding the future of the RMB as a dominant, key international currency. First, it is unknown whether China will proceed with a smooth financial liberalisation and deregulation, although economists agree that financial development and liberalisation are necessary conditions for a currency to become a major international currency (Ito and Chinn 2015, Ito and Kawai 2016). The fact that the Chinese economy started slowing down in 2014 has made policymakers in Beijing become more cautious about further liberalisation of the economy’s financial markets. The current slump of China’s financial markets, following the economic slowdown, has led Chinese authorities to become more active in intervening in financial markets, making the future of the liberalisation efforts bleaker. Second, China is surrounded by countries that belong to the dollar block. Ito and Kawai (2016) find that the extent to which a country belongs to one of the major currency zones affects its decision to use that currency for trade invoicing. This explains why the yen has not been used as a trade invoicing currency by Japan or by neighbouring economies; almost all of Japan’s neighbouring countries belong to the dollar zone.7 China will face the same challenge. The number of China’s neighbouring Asian countries that will break away from the dollar block and start using the RMB for international trade and financial activity is key to the RMB’s further internationalisation. For now, the Asian region’s international finance continues to be dollar-centric. The architecture of Asia’s open macroeconomic policies is very much dependent upon that assumption, but facing the biggest challenge. 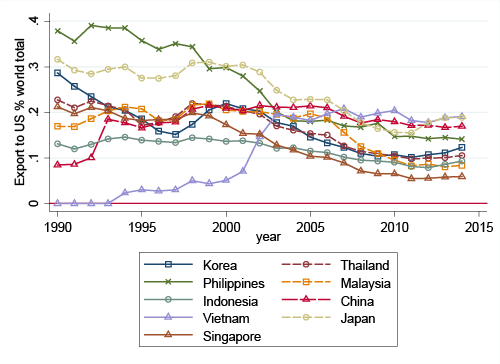 Aizenman, J. and H. Ito (2016), “East Asian Economies and Financial Globalization In the Post-Crisis World”, NBER Working Paper No. 22268. 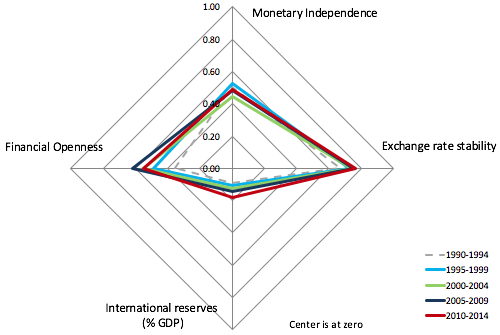 Aizenman, J., M. D. Chinn and H. Ito (2013), “The “Impossible Trinity” Hypothesis in an Era of Global Imbalances: Measurement and Testing”, Review of International Economics, 21(3), 447–458. Aizenman, J., M. D. Chinn and H. Ito (2011), “Surfing the Waves of Globalization: Asia and Financial Globalization in the Context of the Trilemma”, Journal of the Japanese and International Economies 25(3), p. 290 – 320. Aizenman, J., M. D. Chinn and H. Ito (2010), “The Emerging Global Financial Architecture: Tracing and Evaluating New Patterns of the Trilemma Configuration”, Journal of International Money and Finance 29, 615–641. Aizenman, J., M. D. Chinn and H. Ito (2008), “Assessing the Emerging Global Financial Architecture: Measuring the Trilemma's Configurations over Time”, NBER Working Paper No. 14533. Eichengreen, B. and M. Kawai (2015), Renminbi Internationalization: Achievements, Prospects, and Challenges, Washington, DC: Brookings Institution Press. Frankel, J. (2011), “Historical Precedents for Internationalization of the RMB”, CGS/IIGG Working Paper, Council on Foreign Relations, Washington, DC. Ito, T. (2011), “The Internationalization of the RMB: Opportunities and Pitfalls”, CGS/IIGG Working Paper, Council on Foreign Relations, Washington, DC. Ito, Hiro and M. Chinn. (2015). 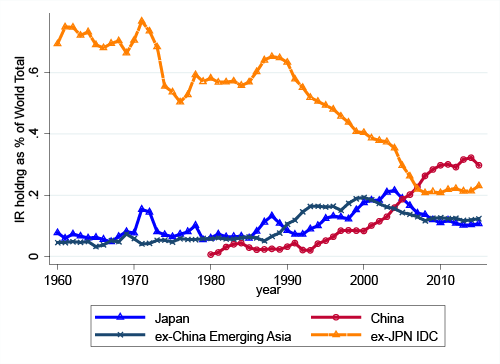 “The Rise of the 'Redback' and China's Capital Account Liberalization: An Empirical Analysis on the Determinants of Invoicing Currencies.” In Eichengreen, B. and M. Kawai, eds., Renminbi Internationalization: Achievements, Prospects, and Challenges. 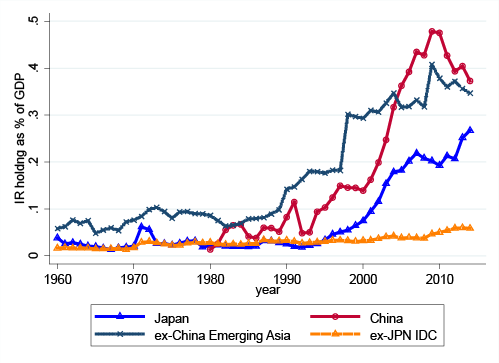 Ito, H. and M. Kawai (2016) “Trade Invoicing in Major Currencies in the 1970s-1990s: Lessons for Renminbi Internationalization,” RIETI Discussion Paper, 16-E-005. Rey, H. (2013), “Dilemma not Trilemma: The Global Financial Cycle and Monetary Policy Independence”, paper prepared for the 2013 Jackson Hole Meeting. They are China, Japan, Korea, Hong Kong, and Singapore. Additionally, India is ranked as the ninth largest IR holder. India, another economic giant in the greater Asian region, has more than 88% of its exports invoiced in the dollar. China discloses information only on the share of RMB settlement in total trade (which is around 20% in 2014). However, it has been speculated that more than 95% of China-US trade is denominated in dollars. This casts a stark contrast with intra-regional trade in Europe where the presence of the dollar is smaller and the euro, the domestic currency for the Eurozone countries, plays a much bigger role. For comparison, refer to Ito and Kawai (2016). We estimate the weights of the dollar, the euro (or the German deutsche mark and the French franc before the introduction of the euro in 1999), the yen, and the British sterling with a rolling window of 36 months by using the methodology popularised by Frankel and Wei (1996). The estimated weights can also be interpreted as the extent to which a country belongs to a certain ‘currency zone’. “Currency mismatch” means that borrowing in a hard currency (e.g., the dollar) and investing domestically with the domestic currency can create liquidity shortage, making it harder to repay the debt when the domestic currency depreciate sharply against the hard currency. Before the introduction of the euro in 1999, we combine the estimated weights for the German deutsche mark and the French franc and treat it as the euro weight. Hence, we have four currency zones: the dollar, euro, yen, and pound zones. To calculate the share of trade with the ‘euro’ currency zone before 1999, we use the volume of trade with the 12 original euro countries. For more details on the issue of RMB internationalization, refer to Eichengreen and Kawai (2015), Frankel (2011), Ito (2011), and Ito and Kawai (2016). As of 2014, the share of Japan’s exports invoiced in the yen is less than 40%, while that of exports in U.S. dollars is more than 50%. In imports, these shares are 20% and 75%, respectively. See Ito and Kawai (2016).